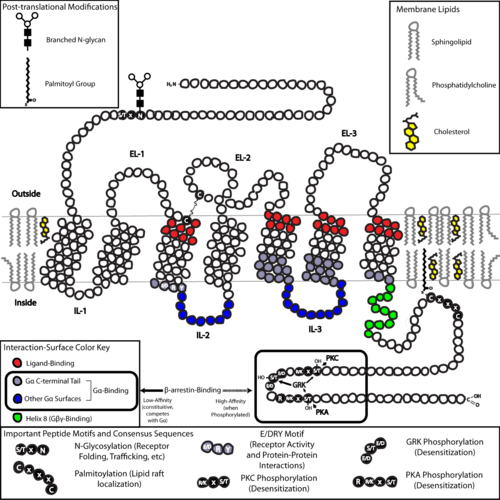 G protein–coupled receptors (GPCRs) which are also known as seven-transmembrane domain receptors, 7TM receptors, heptahelical receptors, serpentine receptor, and G protein–linked receptors (GPLR), constitute a large protein family of receptors, that sense molecules outside the cell and activate inside signal transduction pathways and, ultimately, cellular responses. Coupling with G proteins, they are called seven-transmembrane receptors because they pass through the cell membrane seven times. G protein–coupled receptors are found only in eukaryotes, including yeast, choanoflagellates, and animals. The ligands that bind and activate these receptors include light-sensitive compounds, odors, pheromones, hormones, and neurotransmitters, and vary in size from small molecules to peptides to large proteins. G protein–coupled receptors are involved in many diseases, and are also the target of approximately 40% of all modern medicinal drugs. The 2012 Nobel Prize in Chemistry was awarded to Brian Kobilka and Robert Lefkowitz for their work that was "crucial for understanding how G protein–coupled receptors function". There have been at least seven other Nobel Prizes awarded for some aspect of G protein–mediated signaling. As of 2012, two of the top ten global best-selling drugs (Advair Diskus and Abilify) act by targeting G protein–coupled receptors. Classification Scheme of GPCRs. Class A (Rhodopsin-like), Class B (Secretin-like),Class C (Glutamate Receptor-like), Others (Adhesion (33), Frizzled (11), Taste type-2 (25), unclassified (23)). The exact size of the GPCR superfamily is unknown, but nearly 800 different human genes (or ~ 4% of the entire protein-coding genome) have been predicted to code for them from genome sequence analysis. Although numerous classification schemes have been proposed, the superfamily was classically divided into three main classes (A, B and C) with no detectable shared sequence homology between classes. An early study based on available DNA sequence suggested that the human genome encodes roughly 750 G protein–coupled receptors, about 350 of which detect hormones, growth factors, and other endogenous ligands. Approximately 150 of the GPCRs found in the human genome have unknown functions. Similar to GPCRs, the adiponectin receptors 1 and 2 (ADIPOR1 and ADIPOR2) also possess 7 transmembrane domains. However, ADIPOR1 and ADIPOR2 are orientated oppositely to GPCRs in the membrane (i.e., extracellular N-terminus, cytoplasmic C-terminus) and do not associate with G proteins. Early structural models for GPCRs were based on their weak analogy to bacteriorhodopsin, for which a structure had been determined by both electron diffraction (PDB: 2BRD​, 1AT9​) and X ray-based crystallography (1AP9​). 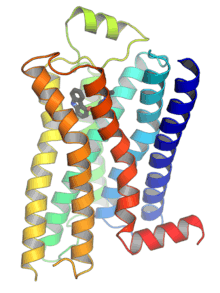 In 2000, the first crystal structure of a mammalian GPCR, that of bovine rhodopsin (1F88​), was solved. While the main feature, the seven-transmembrane helices, is conserved, the relative orientation of the helices differ significantly from that of bacteriorhodopsin. 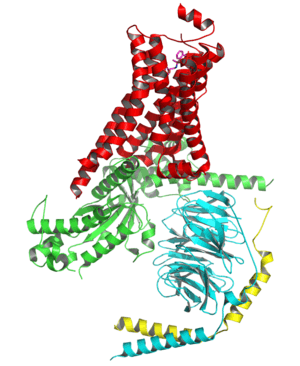 In 2007, the first structure of a human GPCR was solved (2R4R​, 2R4S​). This was followed immediately by a higher resolution structure of the same receptor (2RH1​). This human β2-adrenergic receptor GPCR structure proved highly similar to the bovine rhodopsin in terms of the relative orientation of the seven-transmembrane helices. However, the conformation of the second extracellular loop is entirely different between the two structures. Since this loop constitutes the "lid" that covers the top of the ligand binding site, this conformational difference highlights the difficulties in constructing homology models of other GPCRs based only on the rhodopsin structure. The structures of activated and/or agonist-bound GPCRs have also been determined. These structures indicate how ligand binding at the extracellular side of a receptor leads to conformational changes in the cytoplasmic side of the receptor. The biggest change is an outward movement of the cytoplasmic part of the 5th and 6th transmembrane helix (TM5 and TM6). The structure of activated beta-2 adrenergic receptor in complex with Gs confirmed that the Gα binds to a cavity created by this movement. A structure database, GPCR-HGmod, was recently constructed which contains 3D structural models of all human G-protein coupled receptors, built by the GPCR-I-TASSER pipeline through homology modeling and ab initio structure prediction. The structure of the N- and C-terminal tails of GPCRs may also serve important functions beyond ligand-binding. For example, The C-terminus of M3 muscarinic receptors is sufficient, and the six-amino-acid polybasic (KKKRRK) domain in the C-terminus is necessary for its preassembly with Gq proteins. In particular, the C-terminus often contains serine (Ser) or threonine (Thr) residues that, when phosphorylated, increase the affinity of the intracellular surface for the binding of scaffolding proteins called β-arrestins (β-arr). Once bound, β-arrestins both sterically prevent G-protein coupling and may recruit other proteins, leading to the creation of signaling complexes involved in extracellular-signal regulated kinase (ERK) pathway activation or receptor endocytosis (internalization). As the phosphorylation of these Ser and Thr residues often occurs as a result of GPCR activation, the β-arr-mediated G-protein-decoupling and internalization of GPCRs are important mechanisms of desensitization. In addition, internalized "mega-complexes" consisting of a single GPCR, β-arr, and heterotrimeric G protein exist and may account for protein signaling from endosomes. The G protein–coupled receptor is activated by an external signal in the form of a ligand or other signal mediator. This creates a conformational change in the receptor, causing activation of a G protein. Further effect depends on the type of G protein. 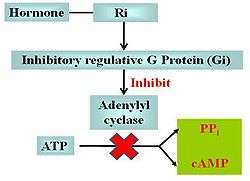 G proteins are subsequently inactivated by GTPase activating proteins, known as RGS proteins. GPCRs include: receptors for sensory signal mediators (e.g., light and olfactory stimulatory molecules); adenosine, bombesin, bradykinin, endothelin, γ-aminobutyric acid (GABA), hepatocyte growth factor (HGF), melanocortins, neuropeptide Y, opioid peptides, opsins, somatostatin, GH, tachykinins, members of the vasoactive intestinal peptide family, and vasopressin; biogenic amines (e.g., dopamine, epinephrine, norepinephrine, histamine, glutamate (metabotropic effect), glucagon, acetylcholine (muscarinic effect), and serotonin); chemokines; lipid mediators of inflammation (e.g., prostaglandins, prostanoids, platelet-activating factor, and leukotrienes); and peptide hormones (e.g., calcitonin, C5a anaphylatoxin, follicle-stimulating hormone (FSH), gonadotropin-releasing hormone (GnRH), neurokinin, thyrotropin-releasing hormone (TRH), cannabinoids, and oxytocin). GPCRs that act as receptors for stimuli that have not yet been identified are known as orphan receptors. The signaling pathways activated through a GPCR are limited by the primary sequence and tertiary structure of the GPCR itself but ultimately determined by the particular conformation stabilized by a particular ligand, as well as the availability of transducer molecules. Currently, GPCRs are considered to utilize two primary types of transducers: G-proteins and β-arrestins. Because β-arr’s have high affinity only to the phosphorylated form of most GPCRs (see above or below), the majority of signaling is ultimately dependent upon G-protein activation. However, the possibility for interaction does allow for G-protein-independent signaling to occur. While most GPCRs are capable of activating more than one Gα-subtype, they also show a preference for one subtype over another. When the subtype activated depends on the ligand that is bound to the GPCR, this is called functional selectivity (also known as agonist-directed trafficking, or conformation-specific agonism). However, the binding of any single particular agonist may also initiate activation of multiple different G-proteins, as it may be capable of stabilizing more than one conformation of the GPCR’s GEF domain, even over the course of a single interaction. In addition, a conformation that preferably activates one isoform of Gα may activate another if the preferred is less available. Furthermore, feedback pathways may result in receptor modifications (e.g., phosphorylation) that alter the G-protein preference. Regardless of these various nuances, the GPCR’s preferred coupling partner is usually defined according to the G-protein most obviously activated by the endogenous ligand under most physiological and/or experimental conditions. The effector of both the Gαs and Gαi/o pathways is the cyclic-adenosine monophosphate (cAMP)-generating enzyme adenylate cyclase, or AC. While there are ten different AC gene products in mammals, each with subtle differences in tissue distribution and/or function, all catalyze the conversion of cytosolic adenosine triphosphate (ATP) to cAMP, and all are directly stimulated by G-proteins of the Gαs class. In contrast, however, interaction with Gα subunits of the Gαi/o type inhibits AC from generating cAMP. Thus, a GPCR coupled to Gαs counteracts the actions of a GPCR coupled to Gαi/o, and vice versa. The level of cytosolic cAMP may then determine the activity of various ion channels as well as members of the ser/thr-specific protein kinase A (PKA) family. Thus cAMP is considered a second messenger and PKA a secondary effector. The effector of the Gαq/11 pathway is phospholipase C-β (PLCβ), which catalyzes the cleavage of membrane-bound phosphatidylinositol 4,5-biphosphate (PIP2) into the second messengers inositol (1,4,5) trisphosphate (IP3) and diacylglycerol (DAG). IP3 acts on IP3 receptors found in the membrane of the endoplasmic reticulum (ER) to elicit Ca2+ release from the ER, while DAG diffuses along the plasma membrane where it may activate any membrane localized forms of a second ser/thr kinase called protein kinase C (PKC). Since many isoforms of PKC are also activated by increases in intracellular Ca2+, both these pathways can also converge on each other to signal through the same secondary effector. Elevated intracellular Ca2+ also binds and allosterically activates proteins called calmodulins, which in turn go on to bind and allosterically activate enzymes such as Ca2+/calmodulin-dependent kinases (CAMKs). 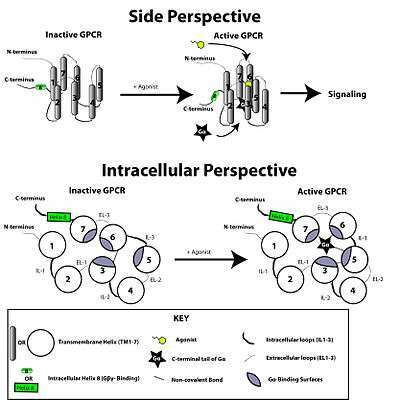 Although they are classically thought of working only together, GPCRs may signal through G-protein-independent mechanisms, and heterotrimeric G-proteins may play functional roles independent of GPCRs. GPCRs may signal independently through many proteins already mentioned for their roles in G-protein-dependent signaling such as β-arrs, GRKs, and Srcs. In addition, further scaffolding proteins involved in subcellular localization of GPCRs (e.g., PDZ-domain-containing proteins) may also act as signal transducers. Most often the effector is a member of the MAPK family. As mentioned above, G-proteins may terminate their own activation due to their intrinsic GTP→GDP hydrolysis capability. However, this reaction proceeds at a slow rate (≈.02 times/sec) and, thus, it would take around 50 seconds for any single G-protein to deactivate if other factors did not come into play. Indeed, there are around 30 isoforms of RGS proteins that, when bound to Gα through their GAP domain, accelerate the hydrolysis rate to ≈30 times/sec. This 1500-fold increase in rate allows for the cell to respond to external signals with high speed, as well as spatial resolution due to limited amount of second messenger that can be generated and limited distance a G-protein can diffuse in .03 seconds. For the most part, the RGS proteins are promiscuous in their ability to activate G-proteins, while which RGS is involved in a given signaling pathway seems more determined by the tissue and GPCR involved than anything else. In addition, RGS proteins have the additional function of increasing the rate of GTP-GDP exchange at GPCRs, (i.e., as a sort of co-GEF) further contributing to the time resolution of GPCR signaling. At any point in this process, the β-arrestins may also recruit other proteins—such as the non-receptor tyrosine kinase (nRTK), c-SRC—which may activate ERK1/2, or other mitogen-activated protein kinase (MAPK) signaling through, for example, phosphorylation of the small GTP-ase, Ras, or recruit the proteins of the ERK cascade directly (i.e., Raf-1, MEK, ERK-1/2) at which point signaling is initiated due to their close proximity to one another. Another target of c-SRC are the dynamin molecules involved in endocytosis. Dynamins polymerize around the neck of an incoming vesicle, and their phosphorylation by c-SRC provides the energy necessary for the conformational change allowing the final "pinching off" from the membrane. Signal transduction mediated by the superfamily of GPCRs dates back to the origin of multicellularity. Mammalian-like GPCRs are found in fungi, and have been classified according to the GRAFS classification system based on GPCR fingerprints. Identification of the superfamily members across the eukaryotic domain, and comparison of the family-specific motifs, have shown that the superfamily of GPCRs have a common origin. Characteristic motifs indicate that three of the five GRAFS families, Rhodopsin, Adhesion, and Frizzled, evolved from the Dictyostelium discoideum cAMP receptors before the split of Opisthokonts. Later, the Secretin family evolved from the Adhesion GPCR receptor family before the split of nematodes. 1 2 Cherezov V, Rosenbaum DM, Hanson MA, Rasmussen SG, Thian FS, Kobilka TS, Choi HJ, Kuhn P, Weis WI, Kobilka BK, Stevens RC (Nov 2007). "High-resolution crystal structure of an engineered human beta2-adrenergic G protein-coupled receptor". Science. 318 (5854): 1258–65. doi:10.1126/science.1150577. PMC 2583103 . PMID 17962520. 1 2 Trzaskowski B, Latek D, Yuan S, Ghoshdastider U, Debinski A, Filipek S (2012). "Action of molecular switches in GPCRs--theoretical and experimental studies". Current Medicinal Chemistry. 19 (8): 1090–109. doi:10.2174/092986712799320556. PMC 3343417 . PMID 22300046. ↑ King N, Hittinger CT, Carroll SB (Jul 2003). "Evolution of key cell signaling and adhesion protein families predates animal origins". Science. 301 (5631): 361–3. doi:10.1126/science.1083853. PMID 12869759. ↑ Filmore D (2004). "It's a GPCR world". Modern Drug Discovery. American Chemical Society. 2004 (November): 24–28. 1 2 Gilman AG (1987). "G proteins: transducers of receptor-generated signals". Annual Review of Biochemistry. 56 (1): 615–49. doi:10.1146/annurev.bi.56.070187.003151. PMID 3113327. 1 2 Wettschureck N, Offermanns S (Oct 2005). "Mammalian G proteins and their cell type specific functions". Physiological Reviews. 85 (4): 1159–204. doi:10.1152/physrev.00003.2005. PMID 16183910. ↑ Royal Swedish Academy of Sciences (10 October 2012). "The Nobel Prize in Chemistry 2012 Robert J. Lefkowitz, Brian K. Kobilka". Retrieved 10 October 2012. ↑ "The Top Prescription Drugs of 2012 Globally: Biologics Dominate, But Small Molecule CNS Drugs Hold on to Top Spots" (PDF). ACS Chemical Neuroscience. Retrieved 2016-02-03. 1 2 3 Bjarnadóttir TK, Gloriam DE, Hellstrand SH, Kristiansson H, Fredriksson R, Schiöth HB (September 2006). "Comprehensive repertoire and phylogenetic analysis of the G protein-coupled receptors in human and mouse". Genomics. 88 (3): 263–73. doi:10.1016/j.ygeno.2006.04.001. PMID 16753280. ↑ Joost P, Methner A (Oct 2002). "Phylogenetic analysis of 277 human G-protein-coupled receptors as a tool for the prediction of orphan receptor ligands". Genome Biology. 3 (11): RESEARCH0063. doi:10.1186/gb-2002-3-11-research0063. PMC 133447 . PMID 12429062. ↑ Attwood TK, Findlay JB (Feb 1994). "Fingerprinting G-protein-coupled receptors". Protein Engineering. 7 (2): 195–203. doi:10.1093/protein/7.2.195. PMID 8170923. ↑ Kolakowski LF (1994). "GCRDb: a G-protein-coupled receptor database". Receptors & Channels. 2 (1): 1–7. PMID 8081729. ↑ Foord SM, Bonner TI, Neubig RR, Rosser EM, Pin JP, Davenport AP, Spedding M, Harmar AJ (Jun 2005). "International Union of Pharmacology. XLVI. G protein-coupled receptor list". Pharmacological Reviews. 57 (2): 279–88. doi:10.1124/pr.57.2.5. PMID 15914470. ↑ Vassilatis DK, Hohmann JG, Zeng H, Li F, Ranchalis JE, Mortrud MT, Brown A, Rodriguez SS, Weller JR, Wright AC, Bergmann JE, Gaitanaris GA (Apr 2003). "The G protein-coupled receptor repertoires of human and mouse". Proceedings of the National Academy of Sciences of the United States of America. 100 (8): 4903–8. doi:10.1073/pnas.0230374100. PMC 153653 . PMID 12679517. ↑ Xiao X, Wang P, Chou KC (Jul 2009). "GPCR-CA: A cellular automaton image approach for predicting G-protein-coupled receptor functional classes". Journal of Computational Chemistry. 30 (9): 1414–23. doi:10.1002/jcc.21163. PMID 19037861. ↑ Qiu JD, Huang JH, Liang RP, Lu XQ (Jul 2009). "Prediction of G-protein-coupled receptor classes based on the concept of Chou's pseudo amino acid composition: an approach from discrete wavelet transform". Analytical Biochemistry. 390 (1): 68–73. doi:10.1016/j.ab.2009.04.009. PMID 19364489. ↑ Gu Q, Ding YS, Zhang TL (May 2010). "Prediction of G-protein-coupled receptor classes in low homology using Chou's pseudo amino acid composition with approximate entropy and hydrophobicity patterns". Protein and Peptide Letters. 17 (5): 559–67. doi:10.2174/092986610791112693. PMID 19594431. ↑ Sharma N, Akhade AS, Qadri A (Apr 2013). "Sphingosine-1-phosphate suppresses TLR-induced CXCL8 secretion from human T cells". Journal of Leukocyte Biology. 93 (4): 521–8. doi:10.1189/jlb.0712328. PMID 23345392. ↑ Hazell GG, Hindmarch CC, Pope GR, Roper JA, Lightman SL, Murphy D, O'Carroll AM, Lolait SJ (Jan 2012). "G protein-coupled receptors in the hypothalamic paraventricular and supraoptic nuclei--serpentine gateways to neuroendocrine homeostasis". Frontiers in Neuroendocrinology. 33 (1): 45–66. doi:10.1016/j.yfrne.2011.07.002. PMC 3336209 . PMID 21802439. ↑ Dorsam RT, Gutkind JS (Feb 2007). "G-protein-coupled receptors and cancer". Nature Reviews. Cancer. 7 (2): 79–94. doi:10.1038/nrc2069. PMID 17251915. ↑ Venkatakrishnan AJ, Deupi X, Lebon G, Tate CG, Schertler GF, Babu MM (Feb 2013). "Molecular signatures of G-protein-coupled receptors". Nature. 494 (7436): 185–94. doi:10.1038/nature11896. PMID 23407534. ↑ Hollenstein K, de Graaf C, Bortolato A, Wang MW, Marshall FH, Stevens RC (Jan 2014). "Insights into the structure of class B GPCRs". Trends in Pharmacological Sciences. 35 (1): 12–22. doi:10.1016/j.tips.2013.11.001. PMID 24359917. ↑ Yamauchi T, Kamon J, Ito Y, Tsuchida A, Yokomizo T, Kita S, Sugiyama T, Miyagishi M, Hara K, Tsunoda M, Murakami K, Ohteki T, Uchida S, Takekawa S, Waki H, Tsuno NH, Shibata Y, Terauchi Y, Froguel P, Tobe K, Koyasu S, Taira K, Kitamura T, Shimizu T, Nagai R, Kadowaki T (Jun 2003). "Cloning of adiponectin receptors that mediate antidiabetic metabolic effects". Nature. 423 (6941): 762–9. doi:10.1038/nature01705. PMID 12802337. ↑ Grigorieff N, Ceska TA, Downing KH, Baldwin JM, Henderson R (Jun 1996). "Electron-crystallographic refinement of the structure of bacteriorhodopsin". Journal of Molecular Biology. 259 (3): 393–421. doi:10.1006/jmbi.1996.0328. PMID 8676377. ↑ Kimura Y, Vassylyev DG, Miyazawa A, Kidera A, Matsushima M, Mitsuoka K, Murata K, Hirai T, Fujiyoshi Y (Sep 1997). "Surface of bacteriorhodopsin revealed by high-resolution electron crystallography". Nature. 389 (6647): 206–11. doi:10.1038/38323. PMID 9296502. ↑ Pebay-Peyroula E, Rummel G, Rosenbusch JP, Landau EM (Sep 1997). "X-ray structure of bacteriorhodopsin at 2.5 angstroms from microcrystals grown in lipidic cubic phases". Science. 277 (5332): 1676–81. doi:10.1126/science.277.5332.1676. PMID 9287223. ↑ Palczewski K, Kumasaka T, Hori T, Behnke CA, Motoshima H, Fox BA, Le Trong I, Teller DC, Okada T, Stenkamp RE, Yamamoto M, Miyano M (Aug 2000). "Crystal structure of rhodopsin: A G protein-coupled receptor". Science. 289 (5480): 739–45. doi:10.1126/science.289.5480.739. PMID 10926528. ↑ Rasmussen SG, Choi HJ, Rosenbaum DM, Kobilka TS, Thian FS, Edwards PC, Burghammer M, Ratnala VR, Sanishvili R, Fischetti RF, Schertler GF, Weis WI, Kobilka BK (Nov 2007). "Crystal structure of the human beta2 adrenergic G-protein-coupled receptor". Nature. 450 (7168): 383–7. doi:10.1038/nature06325. PMID 17952055. ↑ Rosenbaum DM, Cherezov V, Hanson MA, Rasmussen SG, Thian FS, Kobilka TS, Choi HJ, Yao XJ, Weis WI, Stevens RC, Kobilka BK (Nov 2007). "GPCR engineering yields high-resolution structural insights into beta2-adrenergic receptor function". Science. 318 (5854): 1266–73. doi:10.1126/science.1150609. PMID 17962519. ↑ Rasmussen SG, Choi HJ, Fung JJ, Pardon E, Casarosa P, Chae PS, Devree BT, Rosenbaum DM, Thian FS, Kobilka TS, Schnapp A, Konetzki I, Sunahara RK, Gellman SH, Pautsch A, Steyaert J, Weis WI, Kobilka BK (Jan 2011). "Structure of a nanobody-stabilized active state of the β(2) adrenoceptor". Nature. 469 (7329): 175–80. doi:10.1038/nature09648. PMC 3058308 . PMID 21228869. ↑ Rosenbaum DM, Zhang C, Lyons JA, Holl R, Aragao D, Arlow DH, Rasmussen SG, Choi HJ, Devree BT, Sunahara RK, Chae PS, Gellman SH, Dror RO, Shaw DE, Weis WI, Caffrey M, Gmeiner P, Kobilka BK (Jan 2011). "Structure and function of an irreversible agonist-β(2) adrenoceptor complex". Nature. 469 (7329): 236–40. doi:10.1038/nature09665. PMC 3074335 . PMID 21228876. ↑ Warne T, Moukhametzianov R, Baker JG, Nehmé R, Edwards PC, Leslie AG, Schertler GF, Tate CG (Jan 2011). "The structural basis for agonist and partial agonist action on a β(1)-adrenergic receptor". Nature. 469 (7329): 241–4. doi:10.1038/nature09746. PMC 3023143 . PMID 21228877. ↑ Xu F, Wu H, Katritch V, Han GW, Jacobson KA, Gao ZG, Cherezov V, Stevens RC (Apr 2011). "Structure of an agonist-bound human A2A adenosine receptor". Science. 332 (6027): 322–7. doi:10.1126/science.1202793. PMC 3086811 . PMID 21393508. ↑ Rasmussen SG, DeVree BT, Zou Y, Kruse AC, Chung KY, Kobilka TS, Thian FS, Chae PS, Pardon E, Calinski D, Mathiesen JM, Shah ST, Lyons JA, Caffrey M, Gellman SH, Steyaert J, Skiniotis G, Weis WI, Sunahara RK, Kobilka BK (Sep 2011). "Crystal structure of the β2 adrenergic receptor-Gs protein complex". Nature. 477 (7366): 549–55. doi:10.1038/nature10361. PMC 3184188 . PMID 21772288. ↑ Zhang J, Yang J, Jang R, Zhang Y (August 2015). "GPCR-I-TASSER: A Hybrid Approach to G Protein-Coupled Receptor Structure Modeling and the Application to the Human Genome". Structure. 23: 1538–49. doi:10.1016/j.str.2015.06.007. PMC 4526412 . PMID 26190572. 1 2 Qin K, Dong C, Wu G, Lambert NA (Oct 2011). "Inactive-state preassembly of G(q)-coupled receptors and G(q) heterotrimers". Nature Chemical Biology. 7 (10): 740–7. doi:10.1038/nchembio.642. PMC 3177959 . PMID 21873996. ↑ Lohse MJ, Benovic JL, Codina J, Caron MG, Lefkowitz RJ (Jun 1990). "beta-Arrestin: a protein that regulates beta-adrenergic receptor function". Science. 248 (4962): 1547–50. doi:10.1126/science.2163110. PMID 2163110. ↑ Luttrell LM, Lefkowitz RJ (Feb 2002). "The role of beta-arrestins in the termination and transduction of G-protein-coupled receptor signals". Journal of Cell Science. 115 (Pt 3): 455–65. PMID 11861753. ↑ Thomsen AR, Plouffe B, Cahill TJ, Shukla AK, Tarrasch JT, Dosey AM, Kahsai AW, Strachan RT, Pani B, Mahoney JP, Huang L, Breton B, Heydenreich FM, Sunahara RK, Skiniotis G, Bouvier M, Lefkowitz RJ (2016). "GPCR-G Protein-β-Arrestin Super-Complex Mediates Sustained G Protein Signaling". Cell. doi:10.1016/j.cell.2016.07.004. PMID 27499021. ↑ Millar RP, Newton CL (January 2010). "The year in G protein-coupled receptor research". Mol. Endocrinol. 24 (1): 261–74. doi:10.1210/me.2009-0473. PMID 20019124. ↑ Brass LF (Sep 2003). "Thrombin and platelet activation". Chest. 124 (3 Suppl): 18S–25S. doi:10.1378/chest.124.3_suppl.18S. PMID 12970120. ↑ Digby GJ, Lober RM, Sethi PR, Lambert NA (Nov 2006). "Some G protein heterotrimers physically dissociate in living cells". Proceedings of the National Academy of Sciences of the United States of America. 103 (47): 17789–94. doi:10.1073/pnas.0607116103. PMC 1693825 . PMID 17095603. ↑ Rubenstein LA, Lanzara RG (1998). 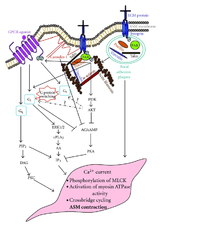 "Activation of G protein-coupled receptors entails cysteine modulation of agonist binding". Journal of Molecular Structure (Theochem). 430: 57–71. doi:10.1016/S0166-1280(98)90217-2. ↑ Teoh CM, Tam JK, Tran T (2012). "Integrin and GPCR Crosstalk in the Regulation of ASM Contraction Signaling in Asthma". Journal of Allergy. 2012: 341282. doi:10.1155/2012/341282. PMID 23056062. ↑ Kim JY, Haastert PV, Devreotes PN (Apr 1996). "Social senses: G-protein-coupled receptor signaling pathways in Dictyostelium discoideum". Chemistry & Biology. 3 (4): 239–43. doi:10.1016/S1074-5521(96)90103-9. PMID 8807851. ↑ Duchene J, Schanstra JP, Pecher C, Pizard A, Susini C, Esteve JP, Bascands JL, Girolami JP (Oct 2002). "A novel protein-protein interaction between a G protein-coupled receptor and the phosphatase SHP-2 is involved in bradykinin-induced inhibition of cell proliferation". The Journal of Biological Chemistry. 277 (43): 40375–83. doi:10.1074/jbc.M202744200. PMID 12177051. ↑ Chen-Izu Y, Xiao RP, Izu LT, Cheng H, Kuschel M, Spurgeon H, Lakatta EG (Nov 2000). "G(i)-dependent localization of beta(2)-adrenergic receptor signaling to L-type Ca(2+) channels". Biophysical Journal. 79 (5): 2547–56. doi:10.1016/S0006-3495(00)76495-2. PMC 1301137 . PMID 11053129. 1 2 Tan CM, Brady AE, Nickols HH, Wang Q, Limbird LE (2004). "Membrane trafficking of G protein-coupled receptors". Annual Review of Pharmacology and Toxicology. 44 (1): 559–609. doi:10.1146/annurev.pharmtox.44.101802.121558. PMID 14744258. ↑ Santulli, Gaetano; Trimarco, Bruno; Iaccarino, Guido (2013). "G-Protein-Coupled Receptor Kinase 2 and Hypertension". High Blood Pressure & Cardiovascular Prevention. 20 (1): 5–12. doi:10.1007/s40292-013-0001-8. ISSN 1120-9879. ↑ Penela P, Ribas C, Mayor F (Nov 2003). "Mechanisms of regulation of the expression and function of G protein-coupled receptor kinases". Cellular Signalling. 15 (11): 973–81. doi:10.1016/S0898-6568(03)00099-8. PMID 14499340. ↑ Krueger KM, Daaka Y, Pitcher JA, Lefkowitz RJ (Jan 1997). "The role of sequestration in G protein-coupled receptor resensitization. Regulation of beta2-adrenergic receptor dephosphorylation by vesicular acidification". The Journal of Biological Chemistry. 272 (1): 5–8. doi:10.1074/jbc.272.1.5. PMID 8995214. ↑ Laporte SA, Oakley RH, Holt JA, Barak LS, Caron MG (Jul 2000). "The interaction of beta-arrestin with the AP-2 adaptor is required for the clustering of beta 2-adrenergic receptor into clathrin-coated pits". The Journal of Biological Chemistry. 275 (30): 23120–6. doi:10.1074/jbc.M002581200. PMID 10770944. ↑ Laporte SA, Oakley RH, Zhang J, Holt JA, Ferguson SS, Caron MG, Barak LS (Mar 1999). "The beta2-adrenergic receptor/betaarrestin complex recruits the clathrin adaptor AP-2 during endocytosis". Proceedings of the National Academy of Sciences of the United States of America. 96 (7): 3712–7. doi:10.1073/pnas.96.7.3712. PMC 22359 . PMID 10097102. ↑ Margeta-Mitrovic M, Jan YN, Jan LY (Jul 2000). "A trafficking checkpoint controls GABA(B) receptor heterodimerization". Neuron. 27 (1): 97–106. doi:10.1016/S0896-6273(00)00012-X. PMID 10939334. ↑ White JH, Wise A, Main MJ, Green A, Fraser NJ, Disney GH, Barnes AA, Emson P, Foord SM, Marshall FH (Dec 1998). "Heterodimerization is required for the formation of a functional GABA(B) receptor". Nature. 396 (6712): 679–82. doi:10.1038/25354. PMID 9872316. ↑ Krishnan A, Almén MS, Fredriksson R, Schiöth HB (2012). Xue C, ed. "The origin of GPCRs: identification of mammalian like Rhodopsin, Adhesion, Glutamate and Frizzled GPCRs in fungi". PLOS ONE. 7 (1): e29817. doi:10.1371/journal.pone.0029817. PMC 3251606 . PMID 22238661. ↑ Nordström KJ, Sällman Almén M, Edstam MM, Fredriksson R, Schiöth HB (Sep 2011). "Independent HHsearch, Needleman--Wunsch-based, and motif analyses reveal the overall hierarchy for most of the G protein-coupled receptor families". Molecular Biology and Evolution. 28 (9): 2471–80. doi:10.1093/molbev/msr061. PMID 21402729. Vassilatis DK, Hohmann JG, Zeng H, Li F, Ranchalis JE, Mortrud MT, Brown A, Rodriguez SS, Weller JR, Wright AC, Bergmann JE, Gaitanaris GA (2003). "The G protein-coupled receptor repertoires of human and mouse". Proc. Natl. Acad. Sci. U.S.A. 100 (8): 4903–8. doi:10.1073/pnas.0230374100. PMC 153653 . PMID 12679517. "The Nobel Prize in Chemistry 2012" (PDF). Retrieved 2012-10-10. "GPCR Database". IUPHAR Database. International Union of Basic and Clinical Pharmacology. Retrieved 2008-08-11. Vriend G, Horn F (2006-06-29). "GPCRDB: Information system for G protein-coupled receptors (GPCRs)". Molecular Class-Specific Information System (MCSIS) project. Retrieved 2008-08-11.